You better get those tin foil hats ready, this Breaking Bad and The Walking Dead fan theory will bend your head! There’s no doubt fans of both AMC’s “The Walking Dead” and “Breaking Bad” have endured some tragically brutal story lines, but a fan theory detailed in a new Netflix YouTube video posits the biggest plot twist of all — that the narratives are inextricably linked. 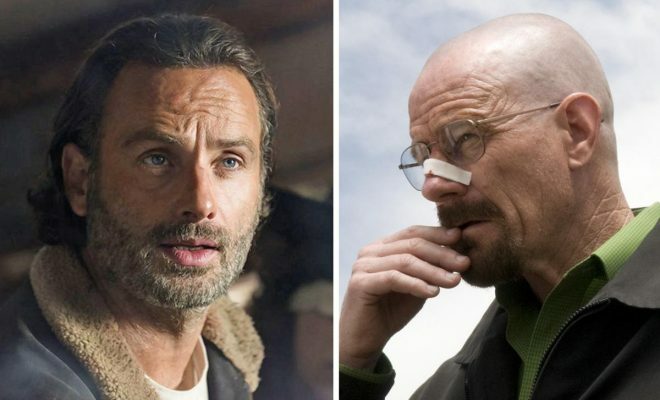 The “Breaking Dead” theory, as it’s termed in the clip, points to multiple connections between the hit AMC shows to prove Walter White’s drug empire is actually what caused the zombie apocalypse Sheriff Rick Grimes and his crew are now struggling to survive. The first connection is the chemistry teacher-turned-crime lord’s iconic blue meth. And remember the red dodge Glen hops in after he saves the good sheriff in Atlanta? Walter gifts his son Walt Jr. the exact same vehicle, but is forced to return it to a car dealership where he’s assisted by a man also named Glen. Finally the video goes on to cast “Breaking Bad” villain Gus Fring as the first zombie — after he’s blown up by his rival Hector Salamanca, he walks out a room, adjusts his tie and then falls to the ground (with half his face blown off all the while). Enthusiastic fans also pointed out a season three moment in which the Governor lists Heisenberg, Walt’s alter-drugdealing-ego, as one of the residents of his post-apocalyptic town.